We’d love your help. Let us know what’s wrong with this preview of Mc Kenzie's Hundred by Frank Yerby. They called her Rambling Rose McKenzie, a woman so wild and sweet, so high-spirited, no man could tame her -- or resist trying. 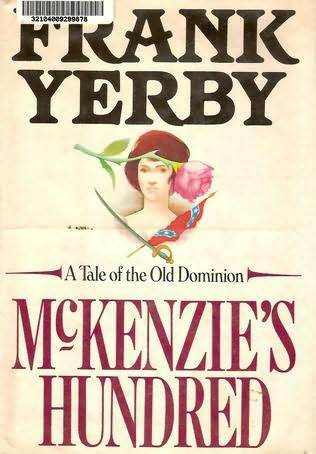 Her birthright was McKenzie's Hundred, rich Virginia acres threatened by a desperate war. To ask other readers questions about Mc Kenzie's Hundred, please sign up. Born in Augusta, Georgia to Rufus Garvin Yerby, an African American, and Wilhelmina Smythe, who was caucasian. He graduated from Haines Normal Institute in Augusta and graduated from Paine College in 1937. Thereafter, Yerby enrolled in Fisk University where he received his Master's degree in 1938. In 1939, Yerby entered the University of Chicago to work toward his doctorate but later left the univ Born in Augusta, Georgia to Rufus Garvin Yerby, an African American, and Wilhelmina Smythe, who was caucasian. He graduated from Haines Normal Institute in Augusta and graduated from Paine College in 1937. Thereafter, Yerby enrolled in Fisk University where he received his Master's degree in 1938. In 1939, Yerby entered the University of Chicago to work toward his doctorate but later left the university. Yerby taught briefly at Florida A&M University and at Southern University in Baton Rouge.